Children can indeed be hard on their things. Some are naturally very careful and take good care of their things while others are naturally very hard on things. I submit, however, that we can teach children of any natural disposition to take care of their possessions. Not only can we, but we should. Some of you might be wondering why bother. Some of you might even worry that making the effort to teach this will encourage materialism. On the contrary, caring for possessions can combat materialism and a spoiled view on life. A child who takes care of items has respect for the item. An item that is cared for does not have a need to be replaced constantly. A child who is careful with possessions has a level of respect for money. The child knows that if something is destroyed it will not be immediately replaced (or replaced at all). Learning to care for possessions means that your items are taken care of. That means you can use the same items for years to come. It means you are living frugally. That means the money you have can be used for other things, things like savings, family vacations, and serving others. It isn’t about being materialistic, but rather about being wise with finances. If you want your child to successfully take good care of her items, you will be most helpful if the items you choose to have in the home are decent quality items. Providing your child only with flimsy toys will mean the toys will easily break. This will mean your child will not have much faith in caring for toys, nor will she bother trying to take care of the toy. You also want to make sure there is a place for childhood admist this effort. Do not make your child afraid of playing with the perfect playdough, writing with the new chalk, or coloring with the new crayons. Allow things to be used as they are meant to be used. You will also want to provide some play clothes for the child. Children need to be able to go out and get dirty sometimes. It is okay to have clothes that are nice clothes a to tell your child to absolutely not play in the mud in those clothes. It is a good idea, however, to have some clothes that your child can wear to get completely dirty in. As your children are young, keep an eye on them as they play. When a child is being too rough with a toy, step in and encourage the child to be careful. Explain that doing what the child is doing can break the toy. Encourage a child to play with the toy in an appropriate manner. A well-made toy can handle being played with in its intended way. Do not allow your child to intentionally destroy toys. Do not give your child too much unsupervised play time in those young years. Again, let toys be used, but you don’t need to let them be destroyed. Having structure to your day will help prevent your child from turning to destroying toys for enjoyment (this does happen). If the child doesn’t have too much time to figure out how to entertain himself without direction, there is a greater chance he will turn to a scientific game of how much force is required to break something (see Too Many Freedoms). Having your child work to take care of things around the house will give your child a greater respect for the effort it takes to keep things in order. Your child is less likely to make a huge mess of things if your child understands what it takes to keep things clean. See Getting Children Actively Engaged in Household Responsibilities. When a child is done playing, teach your child to help clean things up. Even young toddlers can do this. Give young children one task at a time, “Put the books on the book shelf please.” You can choose to clean after each activity or all at once 1-2 times a day (or some other idea altogether). There was a period when Kaitlyn (now 8) would rip pages in books at nap and bedtime when she was around 3 years old. When it first happened, we explained that it wasn’t okay to do that. When it happened again, we decided it was best to remove any books with paper pages from her room. She was only allowed board books until she was mature enough to treat the books appropriately. If your child breaks, destroys, or loses something, do not be quick to go replace it. 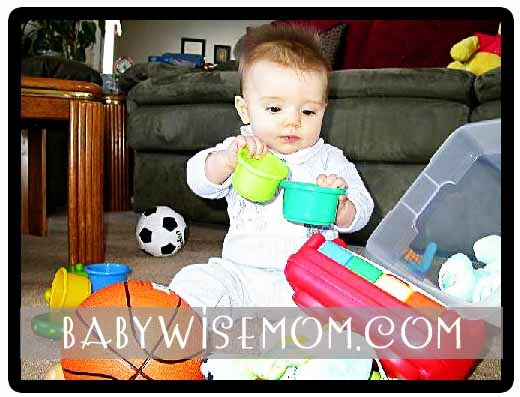 It can be a good learning opportunity for the child to either go without the toy (the child will be more careful understanding that the item is gone because it was destroyed and that the things don’t just come back magically) or work to replace the item. The child can earn money to replace it or do chores to pay back the damage. There will be times things get lost or broken by accident. These are times to have grace and encourage your child to be more careful and responsible in the future. This past spring, one of my girls lost one of her dance shoes. I got her new shoes, but explained that if it happened again, she would need to pay for the new shoes herself. If a child destroys the property of others, absolutely have the child work to replace that item. If a child has all she wants, she will be less careful with what she has. Do not spoil the child. Let the child spend time and effort saving up money to buy things herself. Brayden, age 10, loves Legos more than any other toy. He recently told me that he finds he likes the Lego sets he buys himself more than Lego sets he gets as gifts. He has more of an appreciation for the things he has saved for and worked for, which means he is more careful for those things. He understands their monetary value and will be respectful of what that means.